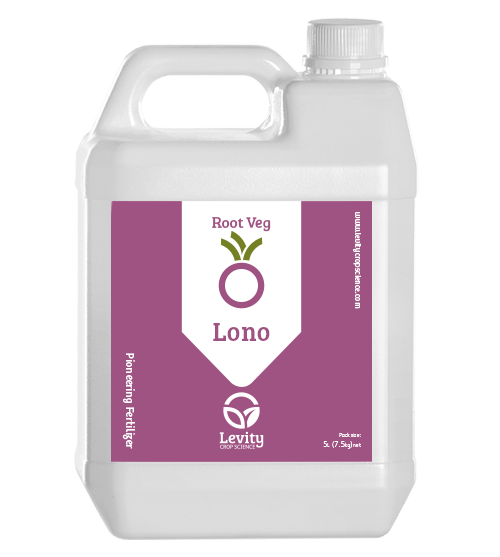 Lono for Root Veg is a smart fertiliser that focuses the plants growth on roots (which are harvested) rather than shoots (which are discarded), by supplying nitrogen in a form that encourages reproductive growth. Lono uses Levity’s LimiN chemistry to hold nitrogen in the amine form, and also contains calcium and important micronutrients. Applied in low doses through the season Lono lifts yield and improves grading, size distribution and quality of root crops. Lono helps crops maintain growth during periods of stress, safeguarding yield. Why is Nitrogen Form Important? Nitrogen form dictates where the plant grows, most forms give vegetative growth. Lono supplies Amine which gives a more compact strong growth habit encouraging root development. Amine nitrogen usally changes to other forms before the plant can use it, but in Lono it is stabilised to keep the form that gives growth of roots and tubers. Too much Nitrate N, makes plants weak and susceptible to pest and disease. Lono keeps plants strong and healthy. At just 5lts a hectare per application a little Lono goes a long way. Lono helps establishment, getting the crop growing quickly and evenly. Used during the season Lono grows the root, and can keep the crop growing in periods of drought and stress, which can improve both yield and quality. Application Rate: 5 l/ha foliar spray at starting at 5 leaf stage make 2-3 applications.